Exp Cell Res. 2017 Jul 15;356(2):160-165. doi: 10.1016/j.yexcr.2017.05.004. Epub 2017 May 5. 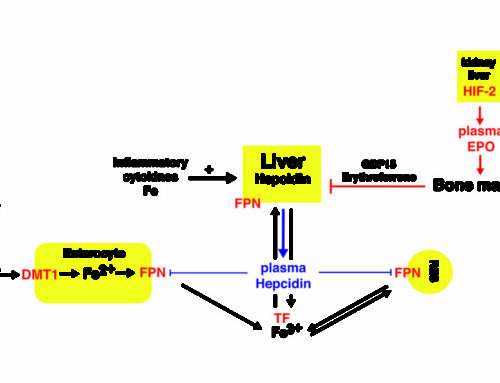 The oxygen-sensitive hypoxia-inducible factor (HIF) pathway plays a central role in the control of erythropoiesis and iron metabolism. 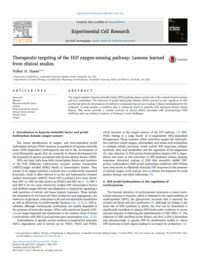 The discovery of prolyl hydroxylase domain (PHD) proteins as key regulators of HIF activity has led to the development of inhibitory compounds that are now in phase 3 clinical development for the treatment of renal anemia, a condition that is commonly found in patients with advanced chronic kidney disease. This review provides a concise overview of clinical effects associated with pharmacologic PHD inhibition and was written in memory of Professor Lorenz Poellinger.